ies and mosquitoes by contact. Aim spray away from person and push button to spray. 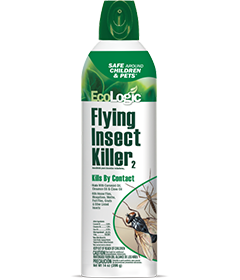 Direct spray at flying insects, contacting as many insects as possible. Spray in short, two- to three-second bursts. Repeat as necessary. Wipe away any excess product. Do not spray directly on houseplants as damage to foliage may result.